A week ago I decided to try to pack in the fags again, I normally smoke about 15 a day, but some days can smoke anything between 10 and 20 day and have been smoking since my early 20’s I’m now 40, I have tried in the past to give up the most I have done is about 3 or 4 months. This time decided to stop because of this cold going around and kept affecting my chest really bad in that my cough was that bad kept making me wrench, that last night I had only got 1 left in my pack and was just before 8pm and the shop across the road closes at 8pm, so knew if didn’t get any more this would be my last for that day and at the moment thought why not try and see how far I can get without fag to see if this would help my chest and cough. 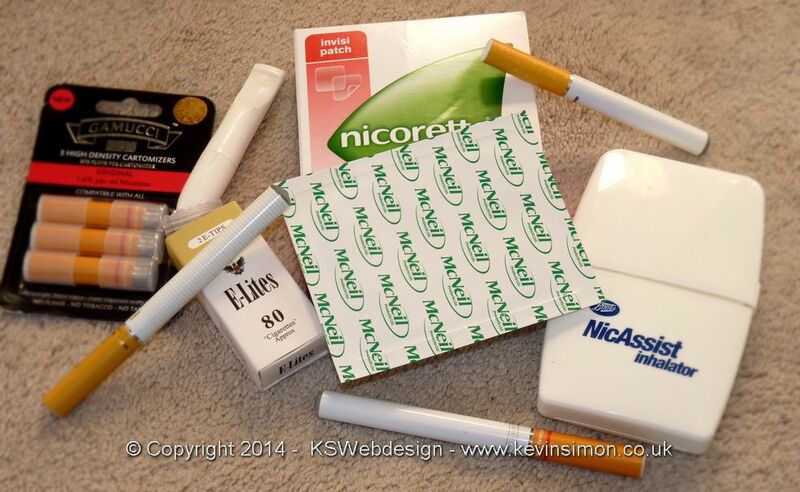 To see my full history of smoking and about the new smoking legislation click HERE. So the next day I put a patch on first thing in the morning, I had some spares from the last time, these are the middle strength patches as found before the higher strength patches gave me bad headaches and really weird and scary dreams. I also have a few e-cigarettes including the e-lites, though these can be a bit expensive on the cartridge refill tips. I also have the gamucci these are great value as got the initial pack from b&m stores at £6.99 that included the battery, usb charger and one cartridge refill, and the refills are only £3.99 for a set of three, and don’t mind the taste of these as not too strong. The first few days were not too bad did have a few cravings, but the patches and having the e-cigarette when needed did help with this and also making sure I kept busy really helped. My main problem is I’m used to having a cigarette in my hand, so keep finding myself with a pen or just the fake fag in my hand. Also I’m am a heavy coffee drinking as used to have a cup of coffee everything had a fag, and really because of not having the cigarettes didn’t really have any coffee, though the caffeine withdrawal then started to kick in giving me headache and even the shakes. My forth day was the worst for me, I could have easily had a cigarette, as the nicotine withdrawal was really bad. I was finding it very hard to concentrate and keep my mind on anything, though all I could think about was having a cigarette. I was trying to think of any excuse just to have one, but had to keep thinking to myself that if I just have one would be back to where I started and and the would be no good as would then be back to smoking my normal amount and then if wanted to stop again would go through the same symptoms. But I didn’t give in even though at one point couldn’t stop my body from rocking and hands shaking. Today on the 7th day for some reason my eczema was playing up more than normal, not sure if this is to do with stopping smoking as their is research showing stopping smoking can make alligies worse. With my eczema when it flares up it gets really bad I have suffered with it for most of my life, so have stock of creams etc. But today even putting the creams on made it feel like someone was stretching my skin, this is the time I would reach for a fag as this would calm me down, but again have to think that wouldn’t fully help. So not sure how I have coped through today.